Get ready to join the best rummy tournaments in the world! Compete in the thrilling arena of online rummy tournaments and test your rummy skills against players from all across the country. Check out our comprehensive Tournament FAQs and their answers, which explain in detail all you need to know about rummy tournaments. What is the procedure to join a rummy tournament on JungleeRummy.com? The total number of players in our rummy tournaments varies from tournament to tournament, depending on the number of players registering to compete. Each table has the capacity to accommodate 6 players maximum. You will be seated at one of the many tables and will be allocated a fixed number of tournament chips. 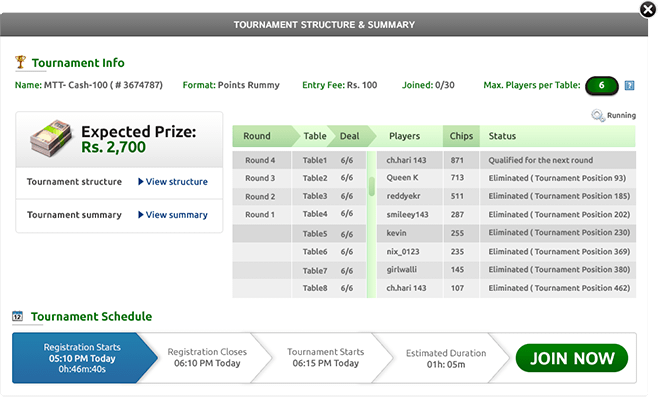 The winner of the tournament will win the rummy chips from the losing players according to the points scored by them. Each player gets 30 seconds to make his/her move on each of his/her turns. If a player does not complete his/her move within the allocated time of 30 seconds, the game continues and the next player gets his/her turn.If a player misses three consecutive turns, he/she is eliminated from the rummy tournament with the score of a middle drop. A player can finish the game following the normal procedure of a rummy game where a card has to be discarded to the Finish slot and the other players have to show their cards. When the pre-decided number of deals is over, the players are assigned ranks according to the number of their chips. The player with the highest number of chips gets the highest rank and progresses to the next round to compete with the winners of the other tables. For example, if 12 tables are competing in a rummy tournament with 6 players at each table, 12 winners from 12 tables (1 from each table) will proceed to the next level to compete with each other. You play cash tournaments with real money. If you want to add cash to your account to play cash tournaments, just click on “Add Cash Instantly” in the game lobby. You can join cash tournaments and win real cash prizes. You need to go to the Tournament section and select the type of tournament you wish to play. 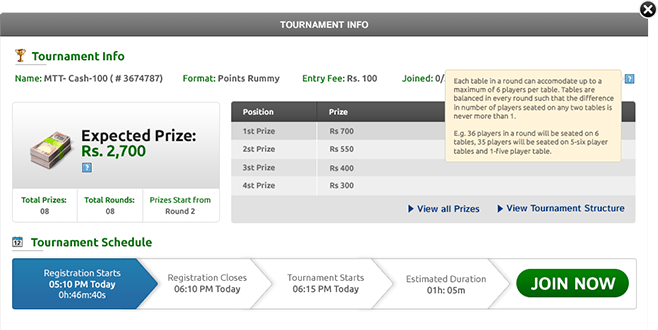 Click on the “Join Now” button to take part in the type of rummy tournament you have selected. How can I withdraw from a tournament? It is possible to withdraw from a rummy tournament when the tournament registration is still open. You will not be able to withdraw from a tournament for which registrations have closed. You can withdraw by clicking on the “Withdraw” button on the Tournament screen. When does the “Join Now” button get disabled? The “Join Now” button is usually disabled when the registrations for a rummy tournament have closed, or when it is about to start at a particular time. 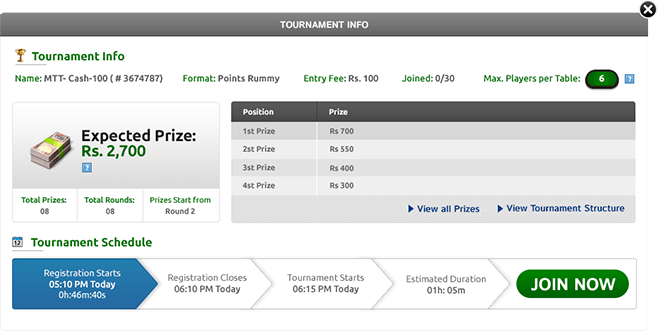 The status of the rummy tournament is displayed, mentioning the reason for having the “Join Now” button disabled. When does a tournament start? When the time for registration is over, the game starts automatically in a popup window on the screen. In case the game window does not pop up on your screen, click on the “Join Now” button in the Tournament section to join the game. It is recommended that you enable the pop-up window of Junglee Rummy to allow game pop-ups. How are tournament seats allocated on JungleeRummy.com? A maximum of 6 players can be accommodated at each game table in a rummy tournament. The players are seated in the order of their registration where the attempt is to fill all the seats at one table before seating any players at the other tables. If there is only one player left for a new, empty table, he is given an automatic win at that table and he moves to the next round. How much extra time will I get on my turn? Each player gets a maximum of 30 seconds to make the move on his/her turn. Every extra second that you use will be deducted from the total time allocated to you. If you fail to act during your extra time, you will miss your turn and won’t be able to make your move. Will I be eliminated from the tournament if I miss three consecutive turns? Yes. You will be automatically eliminated from the game if you miss three consecutive turns during rummy tournaments. How are tournament chips allocated? Each player is allocated a fixed number of chips at the beginning of each round in a rummy tournament. The winner of a round gets a fresh allotment of chips to play in the next round. What is the points system in rummy tournaments? The player who declares first after forming a valid hand gets zero points. All the face cards are worth 10 points each and the other, numbered cards carry points equal to their face value. All the wild and printed Jokers carry zero points. If a player drops on his/her first turn, he/she gets 20 points and if he/she drops after the first pick, he/she gets 40 points. A player who declares without completing the objective of the game gets 80 points. Losing players get points equal to the total of the points carried by the cards in their hands. If a losing player has formed no pure sequence, the points of all the cards in his/her hand are added up. If a losing player has formed two sequences out of which one is a pure sequence, then only points of the cards that are not arranged in sequences and sets are added up. A losing player can get a maximum score of 80 points. And, a player who misses three consecutive turns gets a middle drop of 40 points and is automatically dropped from the game. How are tournament chips and their value calculated at the end of a tournament? Rummy chips carry one point each in every rummy tournament. Only one winner wins all the chips in the tournament at the end of the tournament. For Example, if a player wins a game of six players and five losing players lose with 20, 30 , 40 and 50 points, the winner will get 140 rummy tournament chips. What is the maximum number of points that a player can lose by? A player can lose by a maximum of 80 points, irrespective of the cards in his/her hand. How are the winners of each game and round decided? A rummy tournament starts with the allocation of a fixed number of chips to each participant. In each round, the players need to play a fixed number of games and they are ranked according to the number of tournament chips they have at the table. After a round ends, the player who has the highest number of chips at a table proceeds to the next round. What if 2 players have the same score in a round? Who progresses to the next round then? In case of a tie, the player who won the last deal progresses to the next round. In case the last deal was also tie, the player who won the deal before that progresses to the next round and so on right to the first deal.